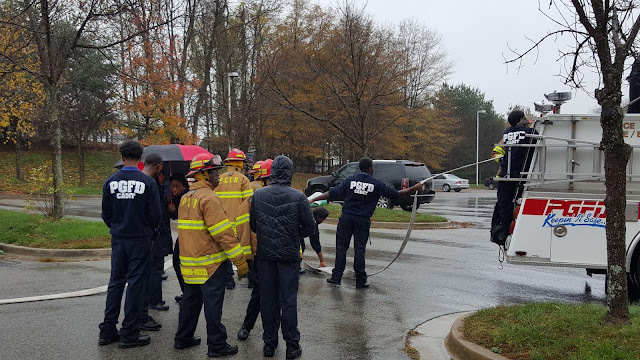 Springdale, MD – It’s a cool, rainy and quiet morning at Charles Herbert Flowers High School in northern Prince George’s County. 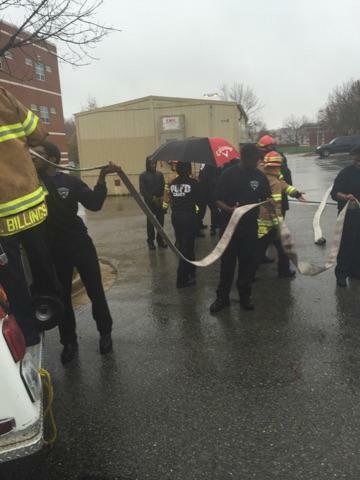 In the parking lot of the school building about fifteen students in firefighter helmets stand around an old fire engine, ignoring the rain while methodically folding dirty, wet and heavy fire hose. It is a peculiar sight for teenagers to be out in the elements performing gritty, physical work. 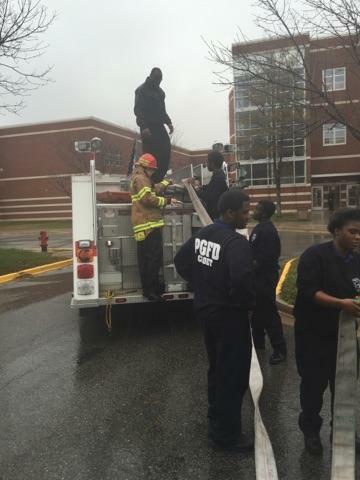 But for students in the High School Fire Science Program (HSFSP), this is not an unusual day. 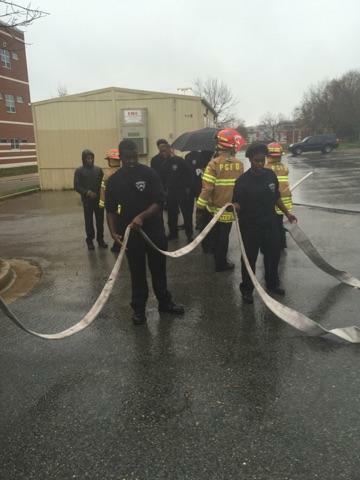 Whether it’s hot or cold, rain or shine, preparing high school students for operational readiness as a Fire and EMS professional is the objective of the program. The fire science program is a two year program for juniors and seniors and part of Prince George’s County Public School’s Department of College & Career Readiness. The Program Director, Deputy Fire Chief Tiffany Green says, “It is geared toward mentoring students in the areas of Fire Science and for Health Care careers. 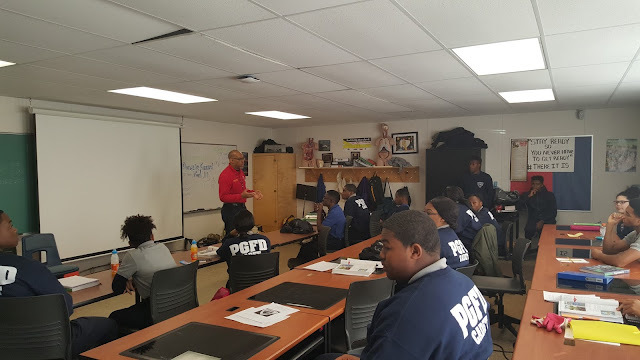 It is designed to introduce them to our department and to careers that are oriented toward public safety. 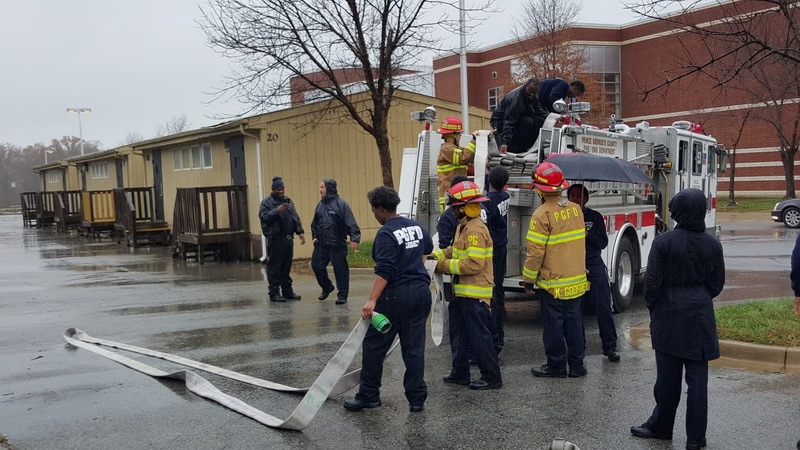 The idea is to help them develop a concept of public service while learning some of the Fire Service disciplines,” she said. 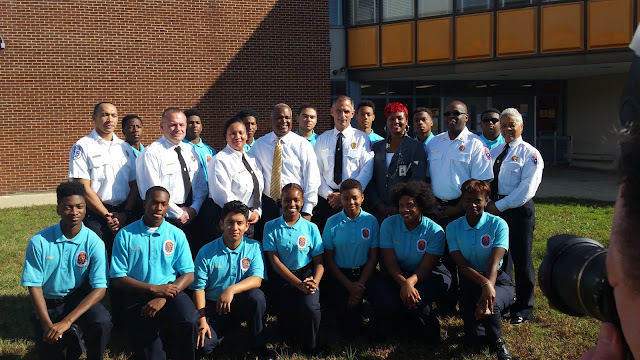 This year the fire science program been expanded to Gwynn Park High School in Brandywine, MD where 13 juniors are enrolled. 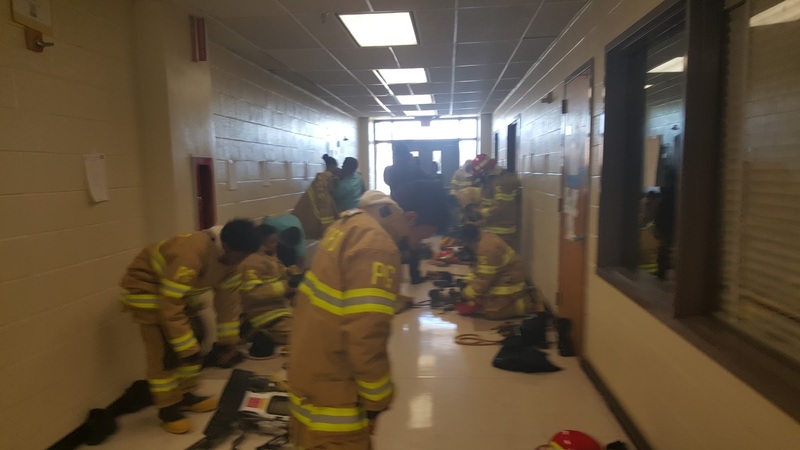 School and Fire/EMS Department officials are hopeful the program will soon be open to all eligible high school students throughout the County. The program offers eight courses related to fire suppression and emergency medical services with the goal of having the students test for professional certifications in these subjects. Students who complete the program could potentially obtain college credits for the courses and graduate with nationally recognized certifications required for employment. Several similar fire science programs exist throughout the state. 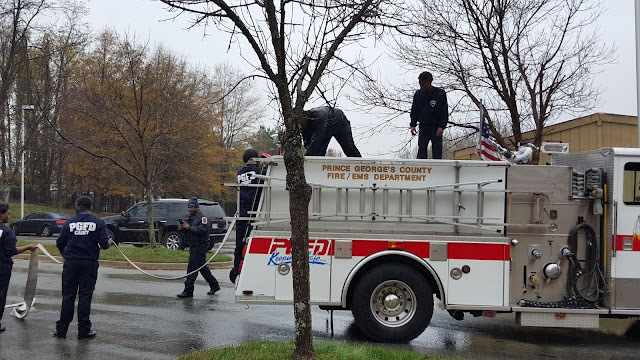 In Prince George’s County the program has an “off and on” history dating as far back as 1968 while gaining momentum in the last five years under current County Fire Chief Marc S. Bashoor. In 1968, Steve Edwards was a member of the first known fire science class in Prince George’s County located at Suitland High School. 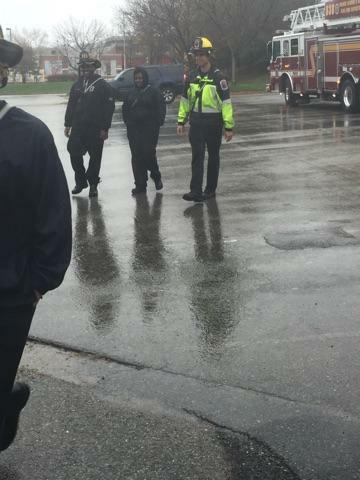 His involvement led to a 25-year career which culminated in his ascension to the rank of Fire Chief. “The school system wanted people to transition from high school to a job. The program gave us job skills. 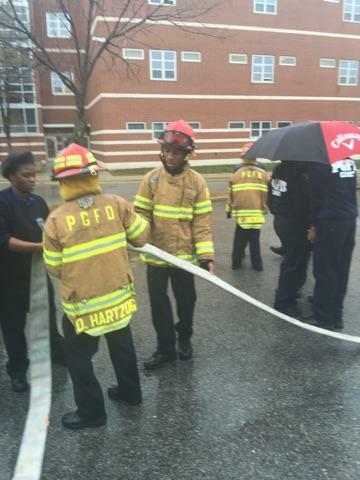 It gave us the knowledge, skills and abilities to be a firefighter at a young age. At that age, college wasn’t on my mind. I was the first person to attend college in my family,” said Edwards. During this time period there was no County fire department but a Department of Fire Protection that reported to five County Commissioners. In 1970 a charter was ratified to establish the current County Fire Department. The program has been at Flowers High School since 2012. From its inception, 32 students have completed the program. 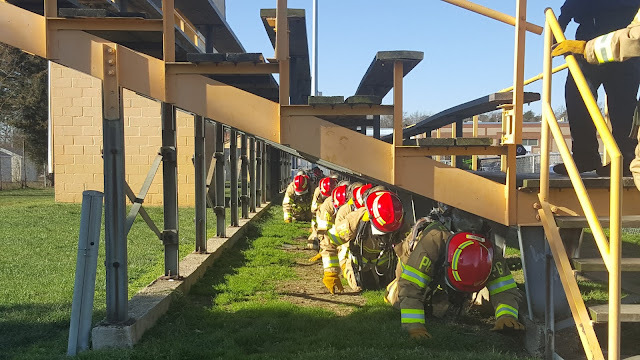 Of these participants, 29 have obtained professional certifications in Firefighter I; 23 in Firefighter II; 31 in Hazmat Operations; and 18 in Emergency Medical Responder. The coursework is rigorous and orienting high school students to a college level curriculum has been a consistent challenge, particularly in the emergency medical courses. 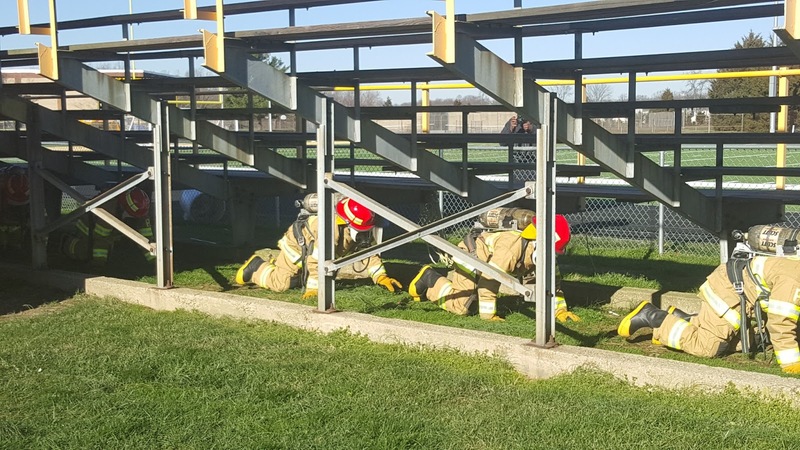 These courses are historically difficult even for professional firefighters who are trained in the career academy. Because of this, the staff is constantly reforming their educational strategies to optimize student performance. “We work to adapt our adult learning environment to a high school student. The attention spans are different. You must have a lot of patience. You have to use different techniques to engage them. Students have an additional workload being in high school. We only see the kids about two or three hours a day so the concepts are not always fully developed. Then we have to deal with the regular ups and downs of teenagers,” said Green. Even with the challenging academics, the students do not hesitate to express their enjoyment in being involved. 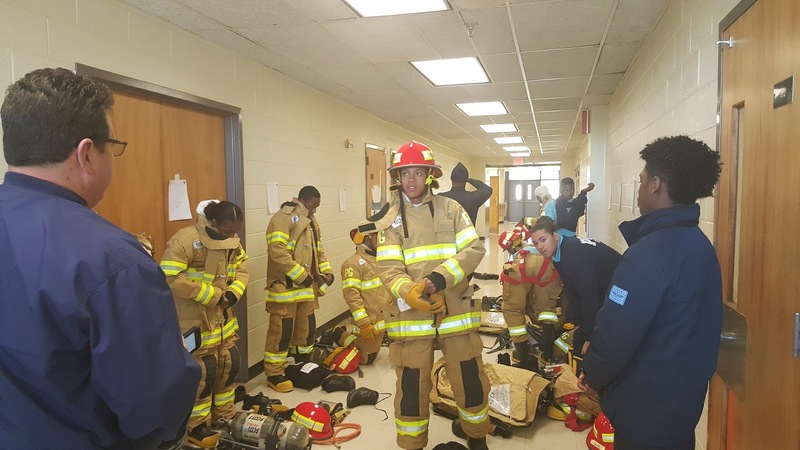 Cadet Nicholas Mufua, a senior at Flowers, plans on applying for a job in the fire service and taking community college classes once he graduates. 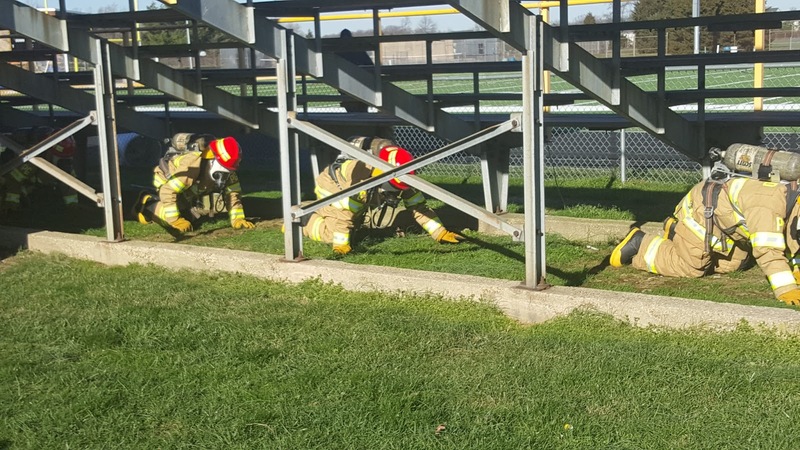 “It gives you a great head start if you are interested in joining the fire department. 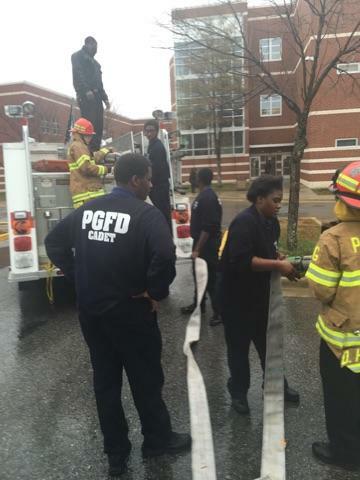 If you are not interested in the fire department, it gives you a lot of life skills that will help you in the future. The instructors are really good. They put a lot of effort and time into helping you with the classwork. Sometimes it’s a little irritating because you have to do things that you really don’t understand. For example, I didn’t understand why we had to shave until I took Firefighter I and realized that you have to shave in order for your mask [breathing apparatus] to seal correctly,” explained Mufua. Cadet Mufua also adds that his participation has made him aware of the high standard of conduct that is required of those who provide public service. “The other students think it’s a cool program to be in, especially the freshman and sophomores. It seems like they look up to us as leaders and expect us to do the right thing in comparison to what other students might do. They seem to have higher expectations of us. They expect us to be more mature than everybody else,” Mufua explains. 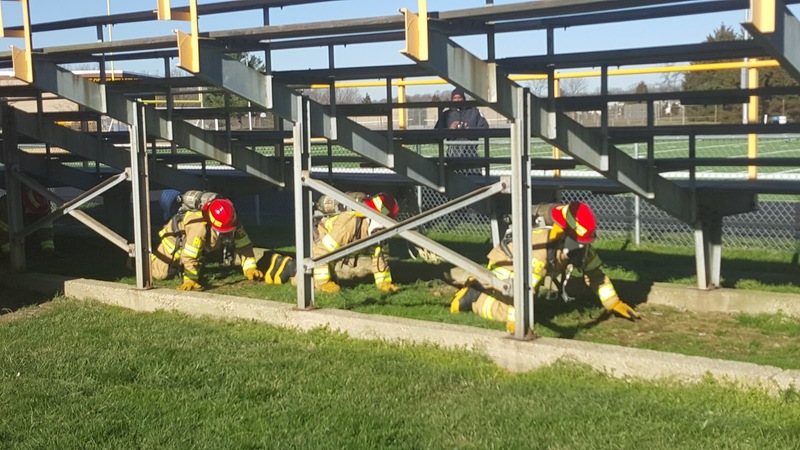 “For the school system, it is understanding things like our instructional requirements: the hours needed to complete a Firefighter I course; how many practical evolutions are required; and understanding what exactly is a practical evolution,” said Green. Flowers High School graduated its third fire science class on June 2. Fire Fighter/Medic Lieutenant Nathan Davies, the Program Coordinator at Flowers, has been working with the program for more than one year. 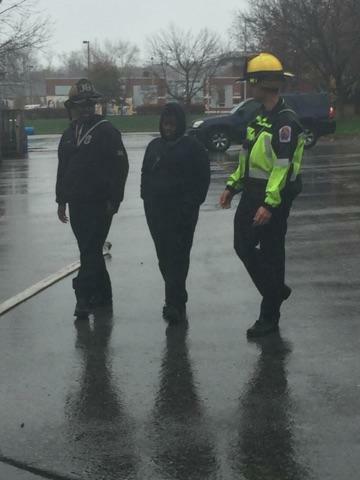 Davies, along with Fire Fighter Joan Robinson-Godfrey and Fire Fighter/Medic Antoine Robinson has regularly given hours of extra personal time on weekends and afterschool to support the students. 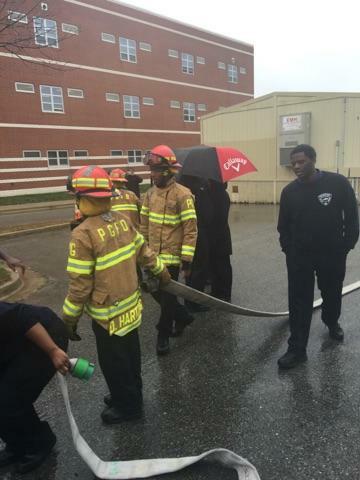 For Davies and his staff, leading the Cadets to their celebrated cap and gown moment is not among the typical duties of a firefighter. It requires complete, personalized dedication to the students. “We have really become like a family. I enjoy the opportunity to give back and inspire young minds where I can. There is a lot of time involved in this program. Sometimes it is a bit frustrating but then it is nice to watch them grow and develop, and watch them take what they have learned here and apply it to their life and their career,” said Davies.